Cricketer Mahendra Singh Dhoni's daughter Ziva met superstar Shah Rukh Khan last week in Chennai during an Indian Premier League (IPL) match and the duo posed for some great pictures together. 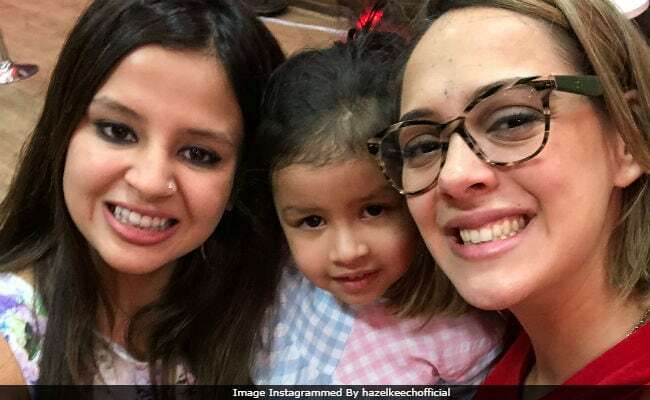 On Saturday, while Dhoni and his team Chennai Super Kings (CSK) were busy playing against Kings XI Punjab (KXIP), Ziva and her mom Sakshi bumped into Hazel Keech, wife of Yuvraj Singh. (He plays for KXIP, owned by actress Preity Zinta). Hazel posted a couple of pictures from their meeting and Ziva, 3, with her cute expressions, totally stole the spotlight from them. "When you bump into friends after a long time and make kissy-squishy hugs," Hazel captioned the post. KXIP won the match but, Dhoni, despite an injured back, gave them a tough fight. Take a look at Sakshi, Ziva and Hazel's pictures here. (Swipe right to see more). On Monday, Dhoni shared an adorable video of little Ziva, who wanted to hug him during the match. The video is now viral and has been viewed over 25 lakh times. "When Ziva wanted to give a hug to papa during the match," Dhoni wrote. Shah Rukh Khan and Ziva's pictures also trended big time last week. SRK had also tweeted about meeting Ziva. He co-owns Kolkata Knight Riders (KKR). Well done my KKR. After a long time a 200 score. Met Karthik's mom & Dhoni's daughter. My day 2/3 rd successful. Thx CSK fans for the love. Meanwhile, pictures of Anushka Sharma, cheering for husband Virat Kohli and his team Royal Challengers Bangalore (RCB), also went crazy viral last week. The Indian Premier League (IPL) began on April 7 and the final match will be played on May 26.